The Solar Sal 44 (13.7m), an electric tour boat designed by Dave Gerr for service on the Hudson River and canals of upstate New York, will be powered by 16 solar panels, 32 8D batteries installed under the center of the boat, and a Torqeedo outboard motor. 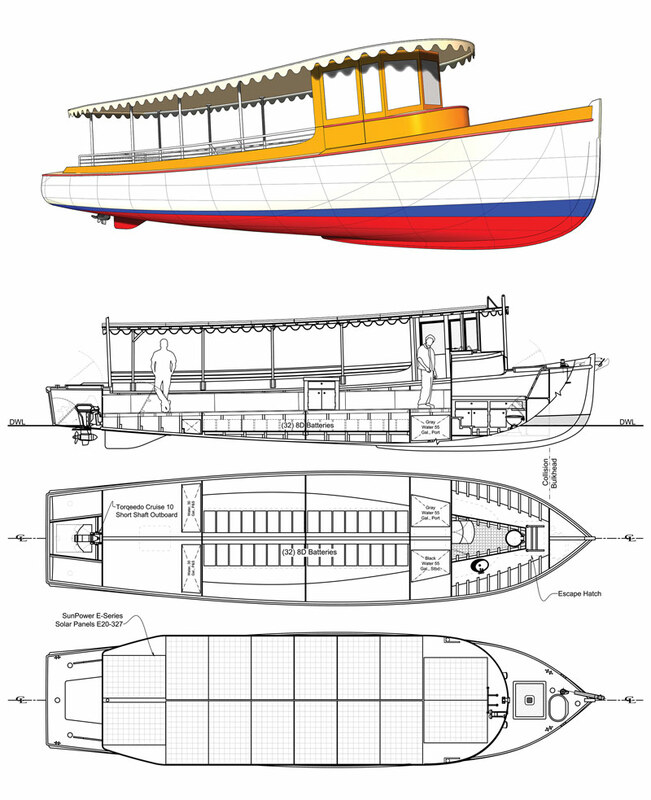 For the design of his third solar boat, Borton commissioned Dave Gerr, a New York City–based naval architect, book author (Propeller Handbook, The Elements of Boat Strength, The Nature of Boats, Boat Mechanical Systems Handbook) and for many years the director of Westlawn Institute of Marine Technology. Gerr drew an easily driven 44‘11“ (13.7m) hull that, like the 39-footer, can be variously configured, but most importantly is able to cruise all day without fuel, or having to plug into shore power. As a 31- passenger tour boat, she will be certified to U.S. Coast Guard Subchapter T regulations—a first, says Gerr. For propulsion, a 10-kW Torqeedo outboard motor is located in a well aft. Sixteen SunPower solar panels on top of the awning charge the 32 8D sealed AGM batteries. Cruising speed is 5–6 knots. Black water and graywater tanks of 55 gal (208 l) each are installed port and starboard, and aft are two freshwater tanks totaling 60 gal (227 l). Of course there is no fuel tank, or smell or sight of diesel in the bilge. Bids were solicited for construction of Solar Sal 44, and the contract went to the Riverport Wooden Boat School at the Hudson River Maritime Museum. The school offers wooden boat building classes for modest fees and also performs restoration work; notable boats in its care include the sloop Clearwater, made famous by folksinger Pete Seeger, and the ferry sloop Woody Guthrie. All work at the school, which opened in 2016, is performed under the direction of shipwright and director Jim Kricker. Borton felt it was important to use as many renewable materials as possible, so Solar Sal 44 is strip-planked wood/epoxy sheathed in fiberglass; Gerr says this type of construction has “longevity characteristics equal to those of conventional fiberglass.” Framing is white pine or fir and planking is red cedar. Scantlings are to American Bureau of Shipping standards. Principal specifications: LOA 44‘11“ (13.7m), DWL 42‘0“ (12.8m), beam 10‘10“ (3.3m), draft 1‘11“ (0.6m), displacement 13,500 lbs (6,198 kg). Gerr Marine, 838 West End Ave., Suite BB, New York, NY 10025 USA, tel. 212–864–7030, fax 212–932–0872, website gerrmarine.com. David Borton, Sustainable Energy Systems, 7 Hilltop Rd., Troy, NY 12180 USA, tel. 518–272–7863, website www.solarsal.solar. James Kricker, Riverport Wooden Boat School at the Hudson River Maritime Museum, 50 Rondout Landing, Kingston, NY 12401 USA, tel. 845–338–0071, fax 845–338–0583, website www.hrmm.org.